Did you know that side burns are named after the American Civil War general Ambrose Burnside? If you want to get the look of mutton chop's namesake, you're going to have to grow out those side burns and even connect them to your mustache. If that sounds like too much work, we'll make it a little easier with this 19th Century Mutton Chops. Is "mustachio'd" an adjective not normally associated with you? Well, that will all change after putting this Super Mustache on! It's got the full furry body that most men only dream about having. Growing your own mustache is soooo mainstream now. If you want to be a real hipster, you need the biggest, furriest mustache in the coffee shop. This one fits with an elastic band, so you can go from normal dude, to hipster extraordinaire in seconds. Do you spend sleepless nights, crying yourself to sleep because your eyebrows just aren't bushy enough? Do you just wish you could say some magic words and make your eyebrows grow 10 sizes bigger? What if we told you that no magic words are required? This eyebrow set lets you have eyebrows way bigger than normal, so you can have gigantic eyebrows. Some ladies think hairy guys are cute, so just think about that for a second. "Hey, everybody relax, Jesus is here! "Whether they need a quick miracle or are just excited to be partying with the big guy, everyone will be stoked to have you at the party. And hey, if you happen to turn some water into wine, we don't think anyone will complain! Endless amount of nonsensical expressions is what you’ll achieve once you’ve stuck a pair of Adult Mad Hatter Eyebrows to your face. This Bad Biker Beard and Moustache will let you look as menacing as can be. You can be a motorcycle gang outlaw, a Caribbean island dictator, or maybe apply for a job making duck calls. Look just like your favorite high school chemistry-teacher-turned-meth-maker with this Badness Goatee!. And you don't have to come down with lung cancer to do it, either. Just peel off the backing and press it into position. Voila! When you live in a cave, you aren't too worried about your hair. I mean, there's dinner to find, you have to constantly be on the look out for saber tooth tigers, and there's no mirrors. 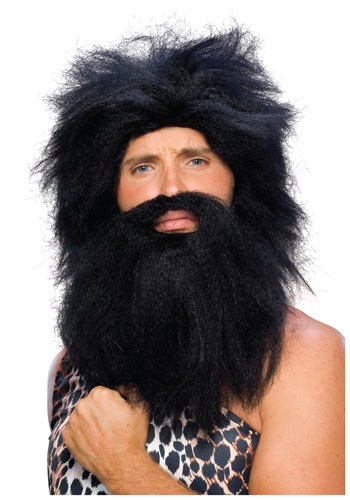 Get the caveman look, without spend a year in a cave, with this Black Prehistoric Wig and Beard. You say it'll be years before he's ready to shave? So what? He can still play Santa with this Child Santa Beard and Moustache. The beard & moustache are connected and sewn to an elastic band that goes around the back of the head. 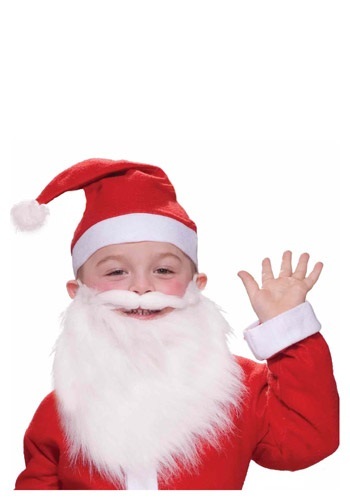 He'll be the cutest Santa anyone has ever seen! You poor, poor soul. Do you not have a handlebar mustache? Any cop that wants instant respect needs one. We get it though. You don't have the time to grow one (or maybe you just can't). That's what this synthetic one is for. Law enforcement is a dangerous job however we’re confident that you can handle it. 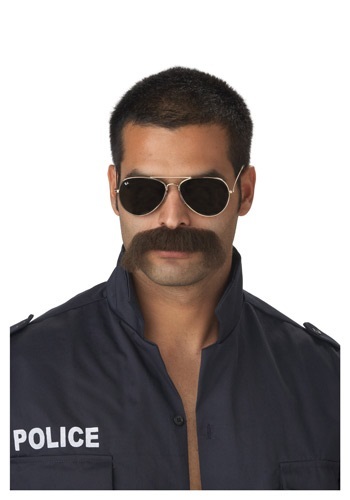 Start by dressing as the long arm of the law and sporting a dashing mustache. Can't grow your own a powerful fake brown mustache will do the trick! Are you ready for a fiesta? You're not! You're saying you don't have a sombrero at the ready along with some fun facial hair? That is a shame. 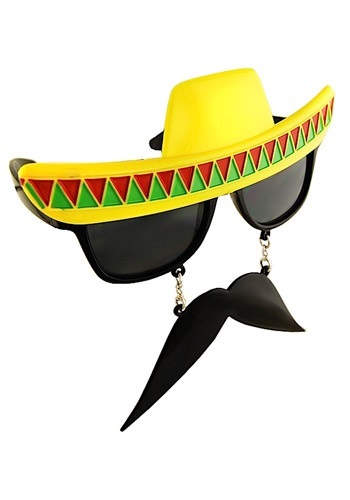 Luckily all you need is a pair of these shades and you'll be set for one epic Cinco de Mayo party! "There is one who could unite them. One who could reclaim the throne of Gondor." Now you can channel the almighty leader of the Fellowship of the Ring when you don this Gandalf Beard Kit. You'll feel wise, powerful, and totally determined to destroy every gold ring in site. 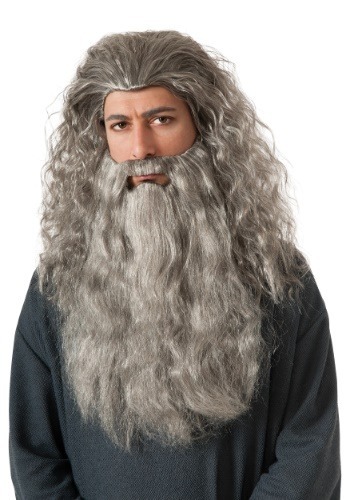 Pick up this kit to pair with your Gandalf costume! 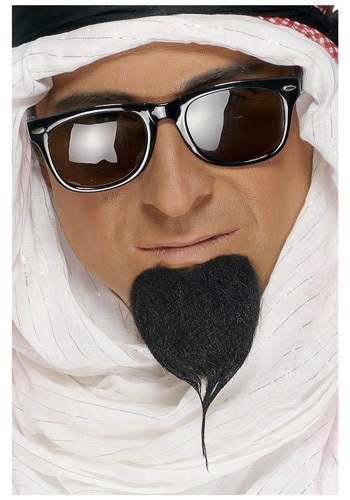 There's no easier way to add some extra detail to your Arab costume than with this goatee beard. 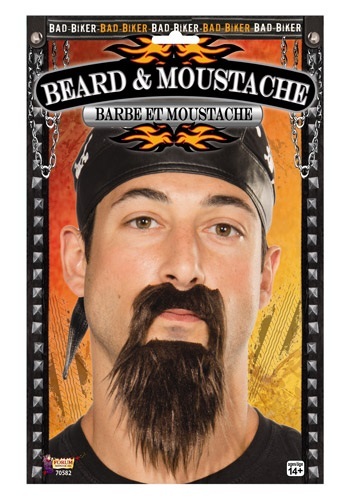 It's a realistic-looking black beard that will compliment any genie, Arab, or terrorist costume. The peel-away sticky strip will last all night, and give your costume the extra character it needs to be a big hit at the party! A wizard without a beard, who ever heard of such a thing? We demand you put on a Grey Wizard Beard and Mustache before any spell casting beings. Seriously....every serious spell-casters has a beard! Some people think it was the rugged terrain, or the solitary lifestyle of the cowboy that made them so tough and grizzled. The truth is, it was all the mustache. The bigger the mustache, the tougher the cowboy. This one big and tough. 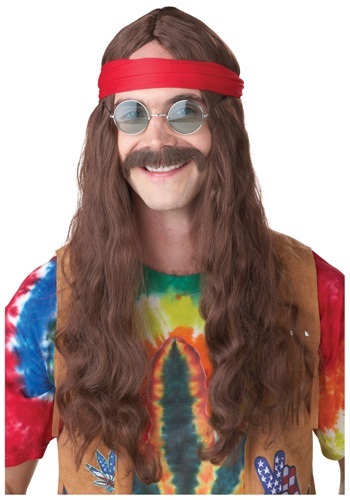 Do all the other hippies laugh at you when you show up to play a game of hacky sack? Maybe it's because you lack the kind of long wavy hair that every hippie spends years growing out. Some just don't have the time to commit to such a long endeavor, which is why it might just be easier to pop a wig on your head. 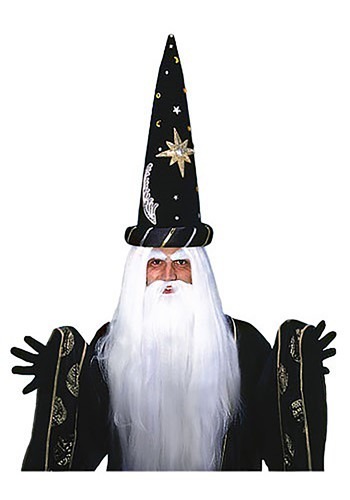 You'll become a great and powerful magician once you've slipped into this Merlin Wig and Beard Set. Magical powers, ability to make things float, and wowing and impressing friends are not included in this set but hey, it's a neat wig! Just in case you didn't get the memo, mullets are back. Business in the front and party in the back is something that everyone can enjoy - just like pickup trucks and beer. 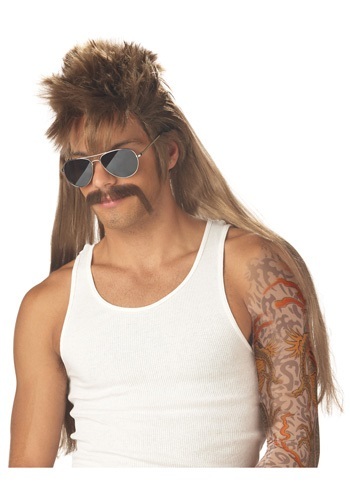 If don't have time to grow one yourself, just take the easy way and put a mullet wig on. That's how we do it. Nothing complements swashbuckling adventure like some manly facial hair. Sometimes that can be downright itchy, so there's no shame in taking the easy route and just using this fake one. D'Artagnan himself wouldn't even be able to tell the difference. Pair it with a Musketeer sword and you'll be in business protecting the royal family in no time. Ahoy matey! 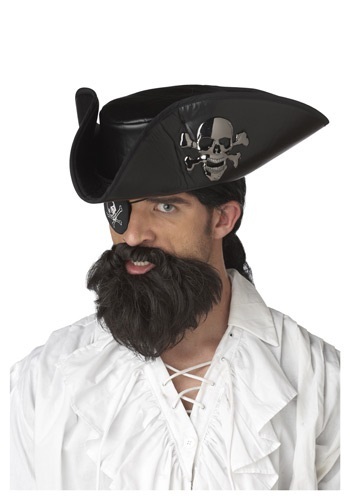 Your high seas adventure begins as soon as you've attached this Pirate Black Beard & Mustache. 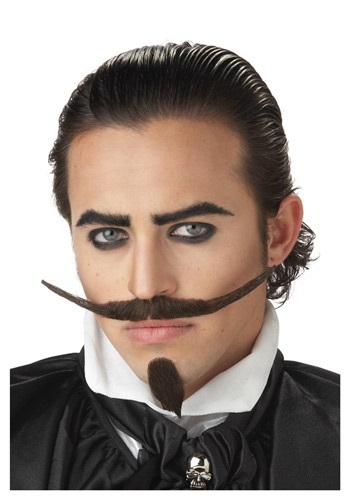 You're not a cut-throat pirate unless you've got some serious facial hair. 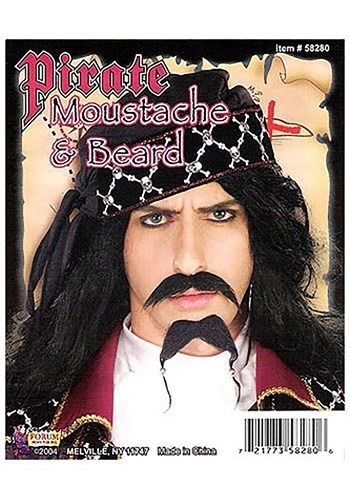 Do you like being a pirate, but hate having to grow an itchy beard just to be a captain? 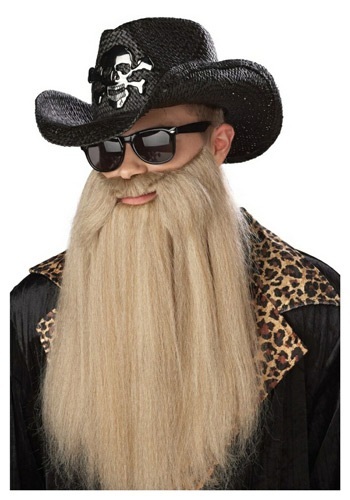 This fake beard solves that little problem. You'll have a look so grizzled, even the neighborhood dog will be addressing you as captain! Video game plumbers and evil 8-bit villains agree. If you want to be an old school stud, you need to be rocking a pixelated facial hair style. It's too bad you were born in reality, instead of in a video game. Fret not though! 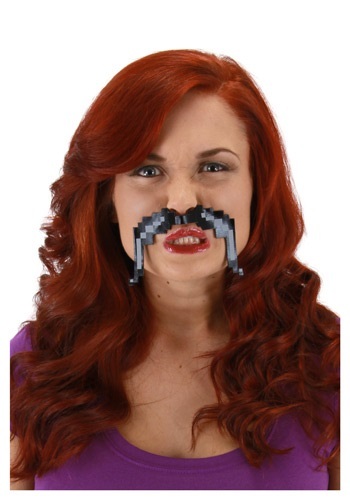 You can still look the part with this facial hair set that comes with 3 different mustaches, so you can be a mustachioed hero, the devious villain, or just plain wacky. 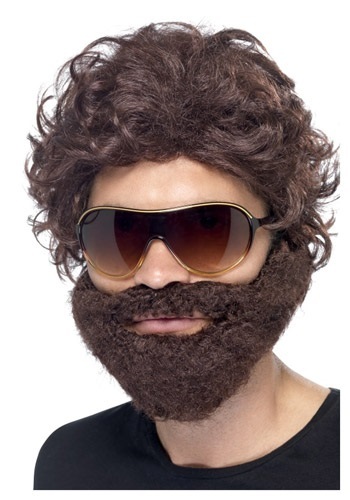 You can "ho, ho ho" all night long but until you have this Santa Claus Wig and Beard Set, you're just a guy screaming obscenities. Wear the set with a classic red suit, it's a lot less intimidating. 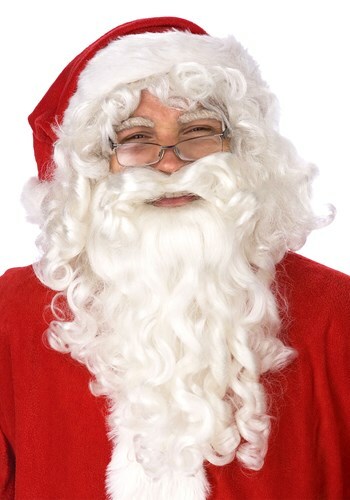 What’s Santa without a Santa Wig and Beard? Christmas would be thrown into chaos. Elves will be left in anarchy. Children will scream and beat their chest and you will rue the day you didn't dress to the nine. Yes, all these things will happen. The most important part to being in a rock band that plays blues music? The beard of course. Growing respectable facial hair takes years, maybe even decades, if you want to get it just right, but chances are, you don't have that kind of time. 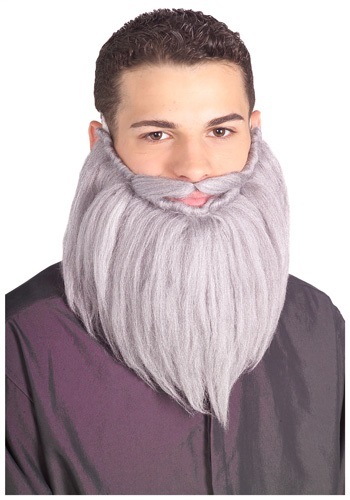 The next best option is to just fake it with one of these beards, which fits with elastic. Being a wild party animal? It's all in the beard. Some might tell you it's about having a set of aviator shades or a messed up hair do, but it's mostly in the beard. Just in case though, this set includes all those items. 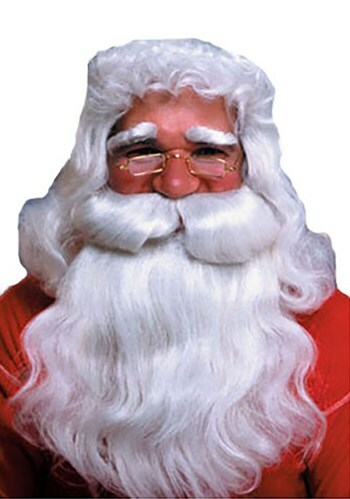 Bring joy and cheer to all who are near with a Straight Santa Wig and Beard. Of course you'll need the suit to pull your look together. 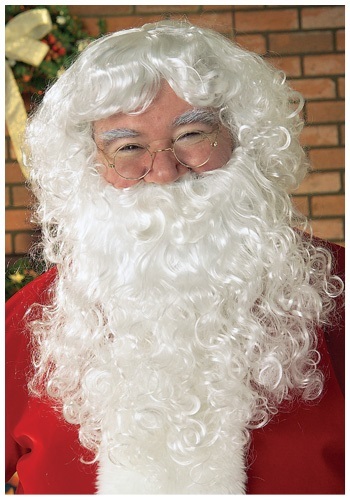 This wig and facial hair is only one step in your Santa transformation! Ho, ho, ho! What would you like for Christmas? 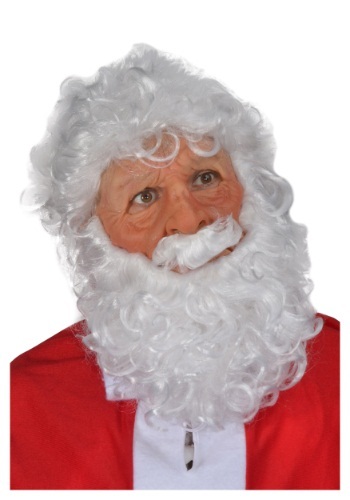 This Super Soft Santa Mask is sure to transform you into the big guy himself (but you will have to take it off to eat your cookies). Wear this Throne Beard and become a horseback-riding warrior prince. Marry a young girl who will become the Mother of Dragons, and beget the Stallion Who Mounts the World. Show off your prowess in battle. You're a Horse Lord, after all! 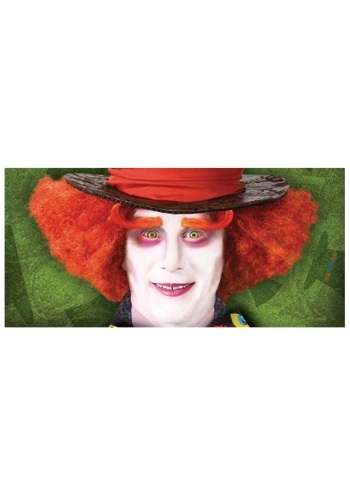 Get Uncle Sam's classic look with this wig and goatee set! This Independence Day, celebrate with style when you pair this accessory set with our Uncle Sam costume. Gambling can take a lot out of you. Watching the chips fly across the table, feeling the rush of a great hand, and the sting of a losing bluff. Sweating out the flop, the turn, the river. Keeping your cool. 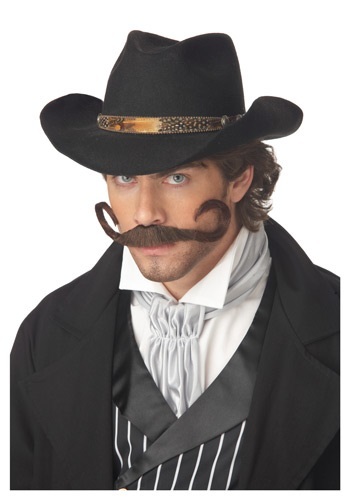 Give yourself a little something to conceal your bluffing face, or something to twirl mischievously as your cards are dealt with this western gambler mustache and beard set. It goes great with any of our outlaw costumes, and will certainly give you the edge this Halloween while you place your bets. Going for a hillbilly look this year? You only have so many days to grow a proper beard. But if you're going for the ultimate hillbilly look you're going to need some help and luckily we can help. 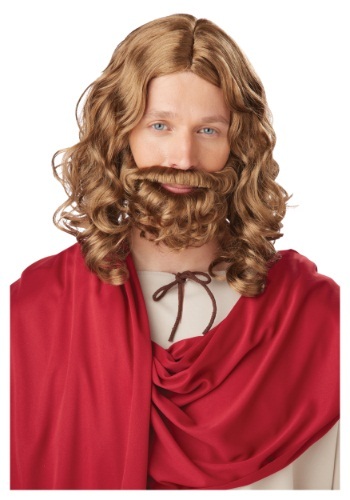 Here at Halloween Costumes we can get you set up with greatest of all beards with this 4 foot long chin attachment. Once you slip this on you feel the power of all that is man is inside you. 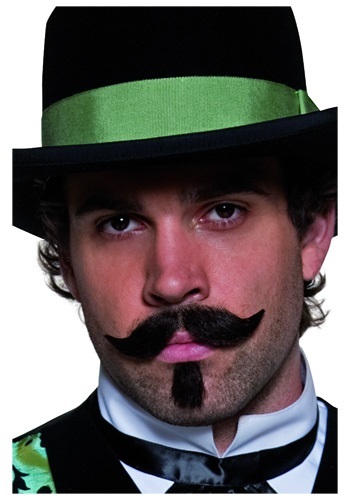 So now you can impress people with your facial hair with out spending the time growing it.